Kamadhenu, also known as Surabhi (सुरभि Surabhī), is a divine bovine-goddess described in Hindu mythology as the mother of all cows. She is a miraculous "cow of plenty" who provides her owner whatever he desires and is often portrayed as the mother of other cattle as well as the eleven Rudras. In iconography, she is generally depicted as a white cow with a female head and breasts or as a white cow containing various deities within her body. 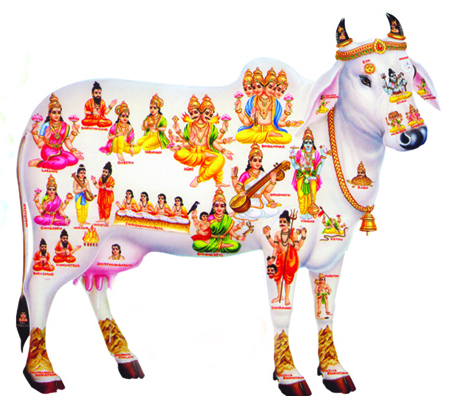 All cows are venerated in Hinduism as the earthly embodiment of the Kamadhenu. As such, Kamadhenu is not worshipped independently as a goddess, and temples are not dedicated to her honor alone; rather, she is honored by the veneration of cows in general throughout the observant Hindu population. Hindu scriptures provide diverse accounts of the birth of Kamadhenu. While some narrate that she emerged from the churning of the cosmic ocean, others describe her as the daughter of the creator god Daksha, and as the wife of the sage Kashyapa. Still other scriptures narrate that Kamadhenu was in the possession of either Jamadagni or Vasistha (both ancient sages), and that kings who tried to steal her from the sage ultimately faced dire consequences for their actions. Kamadhenu plays the important role of providing milk and milk products to be used in her sage-master's oblations; she is also capable of producing fierce warriors to protect him. In addition to dwelling in the sage's hermitage, she is also described as dwelling in Goloka - the realm of the cows - and Patala, the netherworld.